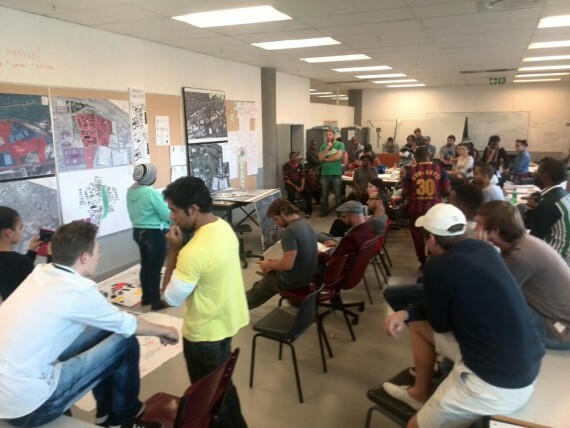 From 27 April to 22 May 2015, the community of Denver informal settlement in Johannesburg partnered with students from the University of Johannesburg’s (UJs) Department of Architecture in a collaborative design studio. Such studios focus on co-producing ideas, scenarios, plans and typologies on informal settlement upgrading and housing. Denver’s first collaborative studio took place in 2014. It was the first of consecutive, annual studios that would build on previous work and span a period of 3-5 years. The 2015 studio therefore started where the last studio ended, focusing on establishing tangible outputs such as a collaborative design handbook and a catalogue of dwelling typologies. In 2014 the studio catalysed the generation of co-produced mapping and socio-demographic data on the settlement. 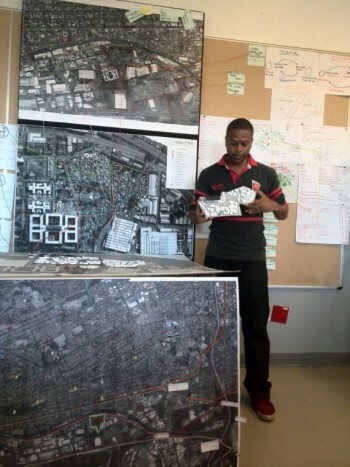 The aim was to formulate community action plans (CAPs) for Denver Settlement in an effort to encourage short-term community initiatives and to support further productive discussion with local government agencies and other stakeholders regarding incremental upgrading in informal settlements. It also introduced students to the necessity and value of planning with communities, shifting the focus from traditional ‘top down’ delivery towards ‘responsive’, community-orientated approaches. For more background on the settlement and the 2014 studio click here. The idea of co-production suggests the involvement of different stakeholders. For this studio, therefore, the role players included Denver community members and leadership, the Ward Councillor and community representative, a collective of community volunteers assembled at various stages of the long-term studio, Aformal Terrain in partnership with the Department of Architecture at UJ and its students and the Alliance’s ISN, FEDUP and CORC who offered technical and social support and facilitation. 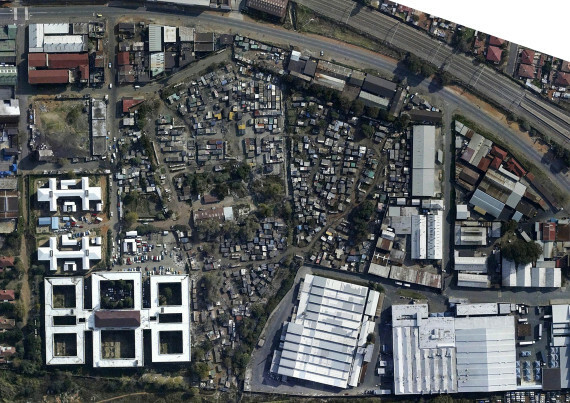 Unlike previous studios that customarily take place in informal settlements, the Denver studio had to change venue when xenophobic violence broke out in Johannesburg. The socio-political atmosphere of the violence and hostel raiding was deemed an unsafe environment to operate under. As indicated, the collaborative outcomes are valuable aspects of the studio’s work. Based on the experience of last year’s studio, Gauteng’s ISN leaders highlighted the need for community members to gain tangible skills throughout the studio and upgrading process just as the students do. Each stage (module) of the studio therefore couples a community member’s practical participation in the studio with project management skills. 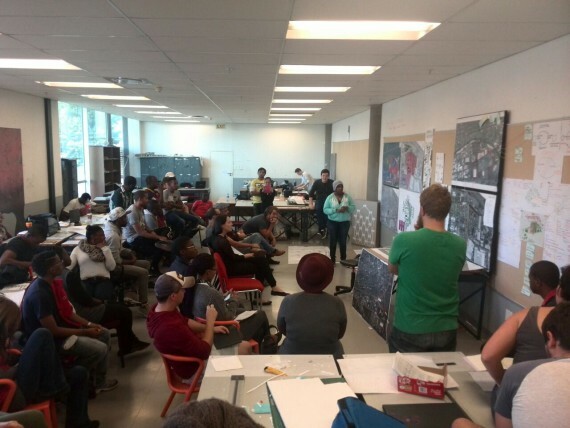 In this year’s studio, more emphasis was placed on community participation and benefit. This led to a revision of the 2014 Memorandum of Understanding (MoU) formalising the partnership between the SA SDI Alliance and UJ’s Architecture Department. 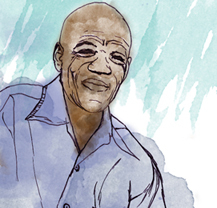 Any data generated by the community residents will remain the property of the residents. Copies of any formal information packages generated from the studio engagement will be made available to community leadership. The objective of this studio was to incrementally build on the content of the 2014 studio, creating continuity and ongoing engagement between past and future studios. It also aimed to develop a collaborative design ‘handbook’; a catalogue of typologies of dwellings in informal settlements with related strategies for improvement through self-build, co-ops, CBOs, local government assistance, infrastructure etc. The intention was that these three focal areas would form a broad scale critical inquiry into current upper strategies for informal settlement upgrading and as a starting point suggested possible linkages with existing bottom-up initiatives. It is envisioned that the outcomes will come to fulfilment in various forms through the studio process over the next 3-5 years in the form of awareness and knowledge packs about the settlement, site handbooks and guides on in-situ upgrading at various scales (shelter, site, policy, planning etc. ), design studies for future densification and longer term formal development. A number of other valuable outputs not limited to this list will be determined through the studio process. 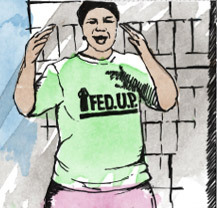 These potential outputs aim to bridge the gap between current bottom-up and top-down strategies already active in Denver – aiming to ‘connect’ community initiatives and local government intentions in more productive conversations toward improvement. 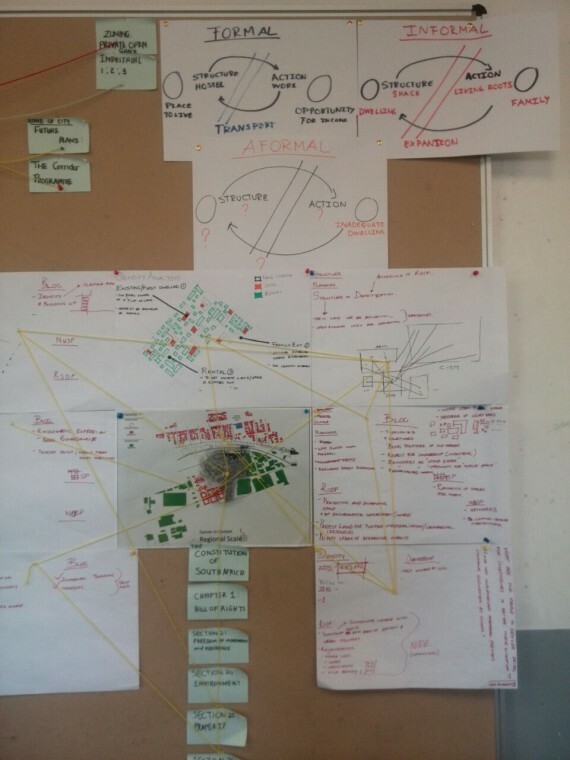 In this final week (loosely termed ‘rapid design prototyping’) students worked in mixed groups, integrating information from the 3 earlier foci with the aim of generating scenarios for the potential improvement of Denver Informal Settlement. It is intended that these scenarios become useful tools for engagement with the residents of Denver in focused workshops and engagements during the course of this year.